Short or long leases available. To inquire about rentals, please phone or write using the contact information in the footer below. We do not post the exact locations of the buildings to protect tenant privacy. Don't be surprised if AHL properties seem a bit more expensive than some others in Vientiane. The AHL business model keeps the ownership of the properties in Lao hands. We rent from the owners, not buy, so we need to recover our costs in the 10-12 years of the lease. Sharing the rent with the owner reduces our margin too. Developers keep the whole rent for the life of the building and so can be much more flexible. Another factor is that we pay our workers good wages and we keep them on staff all year round. For example, Mr. Seet the head carpenter has been with us for 11 years. Finally, service costs money. Unlike most local landlords, AHL tries very hard to respond to repair requests within a few hours. We believe that our social agenda, our beautiful designs, and our excellent service are worth a bit more in rent. AHL furnished properties are complete with cotton towels and sheets, dishes, cookware, glassware, etc. Most of our beds are king size and we buy the thickest and best quality foam mattresses available in Vientiane. No dangerous outgassing from styrofoam-core mattresses here! We try to accommodate requests for furniture exchange from within our inventory whenever possible. To learn about AHL's involvement with the individual properties and to see before and after photos, click the links at left. The list below is in random order so be sure to scroll down to see all the houses and apartments on offer. See notes below if you are looking for something larger or smaller! This is a huge upstairs apartment on a quiet site. It is a wonderful apartment for people who love nature and dogs and cats and fish and birds and squirrels. It is well suited to people who have lived in the tropics before. Building 011 is a large wooden Lao house that has been upgraded but not changed. Apartment 011A has new baths and kitchen, screens, and two porches overlooking large gardens. 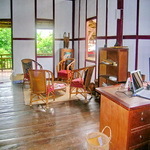 Fully furnished with wood and rattan furniture. Currently there is one air conditioned bedroom and the remainder of the apartment is open to the air. The two very large rooms of the main house are screened but the two porches and the kitchen are open. Tenants love the big main porch and have not had a problem with mosquitoes once they learn how mosquitos behave. 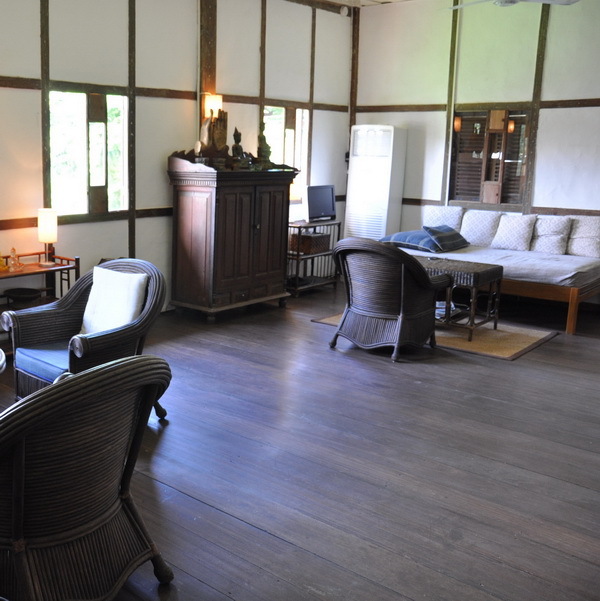 One of the large rooms in the main house (guest room/TV room/art studio) can be divided into two rooms and air conditioned if you want, making a 3 BR apartment, 2 ensuite. Building 011 is beside the Leuxay Hotel with a pool and spa, and 7-10 minutes drive from downtown. 15 minutes walk to Ray's Grille. $1500 per month plus electricity and cleaning. Discount may be possible for 1 year pre-payment. Rent includes city water, drinking water, and rubbish. Guard and housekeeping extra. There is space to add a swimming pool in the main garden. Larger: Apartment 011B is available end September and you can take the whole building for a one-of-a-kind residence. We will open a door between the two apartments to give you lots more space. The garage can also be enclosed to add several large A/C rooms. In this configuration there are 2-3 bedrooms and 2.5 baths upstairs and 2 bedrooms, 2 baths downstairs plus hectares of common space. Smaller: 011A can be divided into two apartments, each with a private entrance. Available now. Apartment 120A. Large upstairs apartment in historic house downtown near Ansara Hotel. Recently decorated from top to bottom. Two huge rooms plus three small rooms to configure as you want. Two full baths. Fully furnished. Great kitchen with dining overlooking the garden. Shared garden with seating area and a fishpond. $1800 per month. Dicount possible. Rent includes drinking water, city water, rubbish. Electricity, guard, housekeeping extra. End September. Apartment 011B. One bedroom modern apartment on ground floor. Lots of light. Great kitchen. Private garden with a beautiful squirrel and birds that sing in the trees. Two cats who love this apartment and two small dogs who will stay outside unless you invite them in. $850 per month furnished plus electricity and housekeeping. Discount for cat and dog lovers and possibly for people who can pay 6 or 12 months in advance. 15 minute walk to Ray's Grille.